If you’re a coffee fan with a taste for cappuccino, we’ve found just the thing for you: something hot, creamy, smooth and delicious. 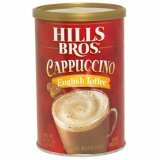 Hills Bros. produces flavored cappuccino that seems to be a fan favorite. Compared to other flavor qualities and price of cappuccino mixes Hills Bros. seem to be the best choice. A full canister of one pound costs around three dollars, which is very reasonable. If you drink your cappuccino a bit weaker than the directions call for then this amount of mix can last you about a month. If you take the regular strength then you’ll get seventeen servings based on the packaged cappuccino mix label. The consistency is rich and creamy, while the taste is just at the right level of sweetness. It’s quite simple to prepare a cup of cappuccino from Hills Bros. flavored mixes. Simply mix it in a cup with eight ounces of hot water or you could choose it drink it ice is preferred. The instructions go into detail on the container. If you have particular needs then the Hills Bros. cappuccino mixes come in different varieties. They are decaf, regular, fat free and carb wise. The carb wise variation contains ninety percent less sugar. It’s important to note that it’s sweetened with Splenda. Another important difference is that the carb wise cappuccino mix is at a reduced size of twelve ounces but the servings per container have been increased to twenty eight. This could be due to the fact that less sugar is added. The costs are all around the same price. The flavors that Hills Bros. offers are Vanilla, English Toffee, White Chocolate, Caramel and Double Mocha. If you are strict about eating Kosher there is no need to worry. Hills Bros. Cappuccino Mixes are certified Kosher by the Union of Orthodox Rabbis. Some other highly rated brands of flavored cappuccino mixes are Folgers, Nescafe and Bustello. Instant cappuccino mixes may be a great alternative to brewing because of the short preparation time. This is great for morning where you wouldn’t otherwise want to mess around with brewing regular cappuccino. Another great plus is that instant mixes usually offer flavors so you can find what suits your taste, literally. Or if you prefer change and hate routine you could alternate your cappuccino flavors for each day of the week. Although Hills Bros. cappuccino mixes seem to claim the top of the list you’ll have to shop around to find which brand fits the texture you prefer as well as taste and special needs if any. Not to mention that you could take these mixes with you while you travel.